One of the biggest secret is out. Wild child turn soldier, Prince Harry, has been secretly fighting in Afghanistan since Christmas. He is a J-TAC (Joint Terminal Air Controller). He serves on the frontlines in Afghanistan's Helmand Province. 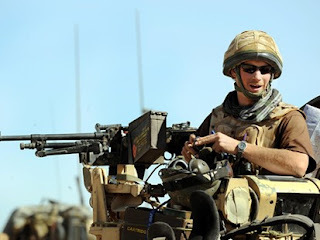 The third in line for the throne has coordinated major air support against the Taliban and taken part in foot patrols with his fellow soldiers. The prince arrived in Afghanistan Christmas Eve. A week later, he oversaw his first airstrike on a bunker system behind Taliban lines in which up to 15 enemy fighters had been positively identified from the air. Perhaps this could be a positive turning point for Prince Harry. In the last few year, he has made more news being served alcohol at various nightclubs than he has serving his country. I once read an article predicted that Prince Harry would be the first member of the royal family to go to the outer space. Looking at the path he is going, it might happen one day.